An ultimate Demon Lord that raised its power and spirit to their utmost limits. Instead of evolving in wickedness, it maintained a calmer mental state, and its three, once-baleful red eyes have become green. It commonly demonstrates incomparable power and speed, and four jet-black wings are growing from its back. You can almost say that before the Beelzebumon that took on this figure, the opponent no longer exists. Its right arm is integrated with its Blaster, and fires powerful energy waves to disintegrate everything into atoms. 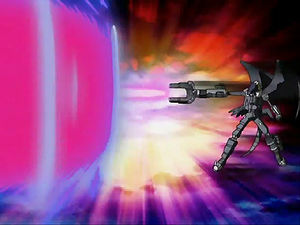 Its Signature Move is firing a destructive wave from the Blaster on its right arm (Death Slinger), and its Special Move is drawing a magic circle before itself, then firing destructive waves toward the center (Chaos Flare). n., A destructive or damaging influence. 1} v., To blow in loud, violent gusts, as the wind during a storm. 2} v., To speak in a loudly arrogant or bullying manner. 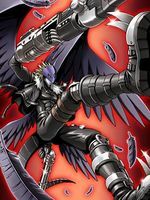 Anime/Manga Digimon Tamers: "Connected Hearts - The Revival of Beelzebumon"
カオスフレア Kaosu Furea Corona Destroyer/Chaos Flare/Chaotic Flare Magnifies the firepower of its Blaster with a magic circle. 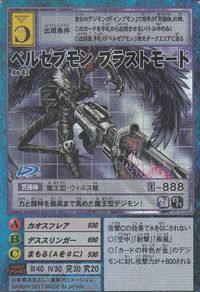 デススリンガー Desu Suringā Corona Blaster/Dark Ringer Inflicts dark-attribute damage with its Blaster. ダブルインパクト Daburu Inpakuto Double Impact/Blast Mode Fires from both Blaster and Berenjena. Jūouken [N 1] Beast King Fist 獣王拳 N/A Fist of the Beast King Fires spiritual energy from its fist in the form of a lion's head. Slashes target with claws infused with dark power. Attacks with Berenjena from the air, or calls down lightning on the enemy. 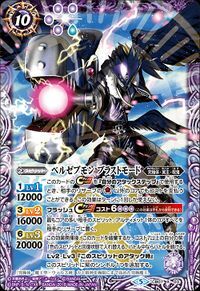 ブラッディスキュアー Buraddi Sukyuā Black Scewer Pierces the enemy with beams of dark matter from its Berenjena. 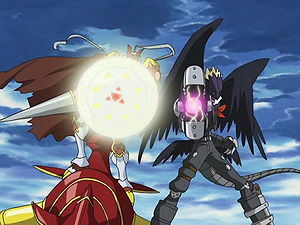 Beelzebumon Blast Mode is the partner of Ai and Makoto. When Impmon came back to the Real World with the Tamers, he returned to Ai and Makoto. 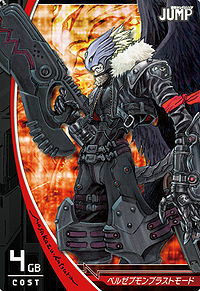 When he saw the Tamers friends fighting the D-Reaper on TV, he went to help. Before he left, Makoto gave him his favorite toy gun to help him fight and Ai kissed him on the cheek. 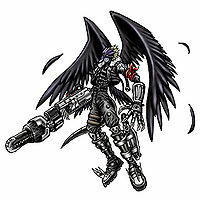 With his Tamers' wishes in mind, he managed to evolve into Beelzebumon, and using the gun, he evolved to Blast Mode. 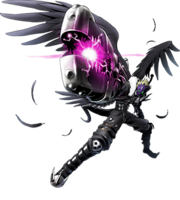 Makoto's gun was his metal enhancement. With his newfound power, he assisted in battling the D-Reaper and looking for Juri. He and Culumon infiltrated the kernel sphere, but it spit Beelzebumon back out. 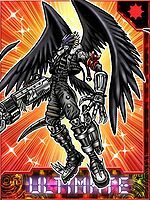 After Dukemon attacked using Grani's Yuggoth Blaster, revealing the kernel sphere again, Beelzebumon used Leomon's Jūouken to to break the barrier, freeing Juri, but her fear and confusion sealed it again. 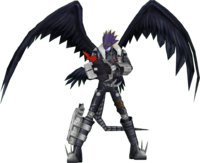 He was then nearly killed when the D-Reaper's flying blades chased him and injured him, though he survived he reverted back into Impmon. Available as the evolution of Impmon and an unlockable character. 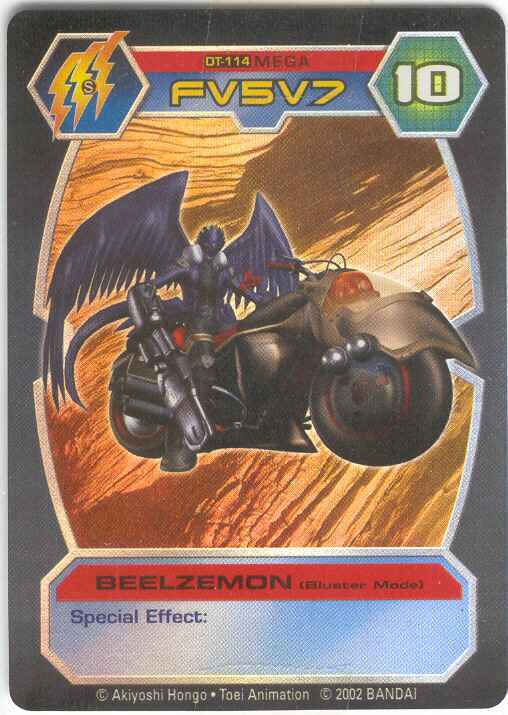 Beelzebumon: Blast Mode is an obtainable Evolution or can be Jogressed from Belial Vamdemon and Dukemon. Its special is Double Impact. Beelzebumon: Blast Mode can be obtained four ways: Playing as Guilmon or V-mon, clear the Card Retrieve side quest with 1HP remaining on Hard Mode, or while playing as Agumon or DORUmon, clear the Item Road Quest on Hard Mode. 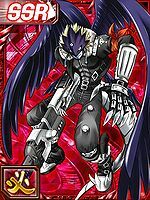 Beelzebumon: Blast Mode is a boss Digimon as well evolves from Beelzebumon if one of the best Impmons of the server or by Special Card Evolution as an obtainable Digimon. 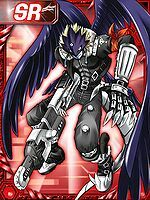 He's a member of the Gaia Origin, before the battle with Dukemon Crimson Mode, after Alphamon, and Omegamon. 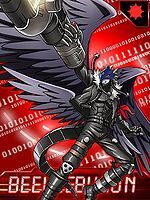 Beelzebumon: Blast Mode is an available Burst Mode Evolution for Beelzebumon. It can be unlocked if level 65 or above with the item Toy Gun. 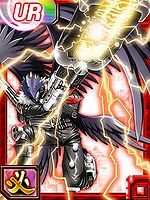 Beelzebumon Blast Mode is only obtainable as a collectible card. 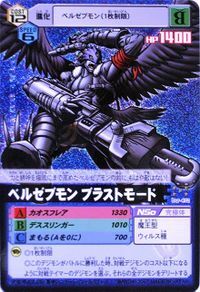 Its card is part of the Demon Lords of Gluttony (暴食の魔王 Bōshoku no Maō) set. 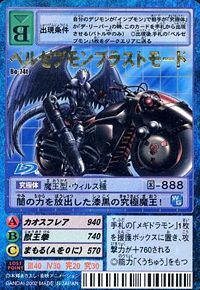 Beelzebumon Blast Mode is only obtainable as a collectible card. The destructive king's final form! Its positron gun releases the flames of hell!! 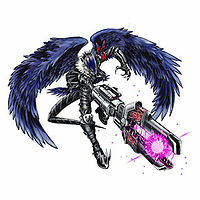 This black-winged gun expert raised its spirit and power to their ultimate! 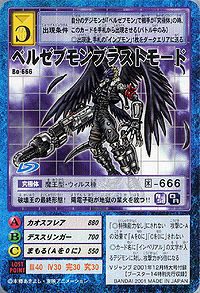 A jet-black Ultimate Demon Lord who unleashes the power of darkness! 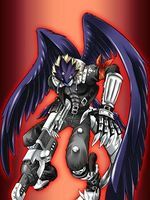 This Demon Lord Digimon has raised its strength and spirit to their limits! 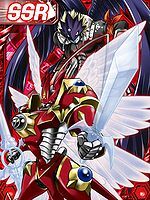 It took on this form after regaining its heart of trust and turning into the ultimate Demon Lord. 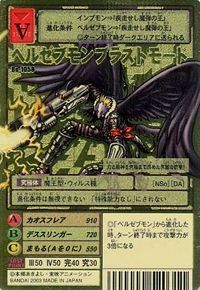 Not only have its sinister, shining red eyes turned into calm, green ones, it also gained extraordinary power and speed. Its right arm has fused with the Blaster to become one. Beelzebumon, who only relied on pure power, has evolved to heighten its power and spirit to their limits. 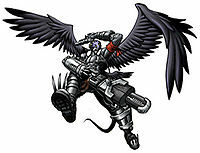 It gained four wings, which gave its body exceptional power and speed. 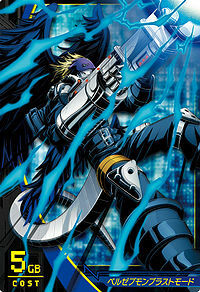 With the Blaster which it has become one with, it finishes opponents off with unparalleled gun-action. An ultimate Demon Lord that raised its power and spirit to their utmost limits. 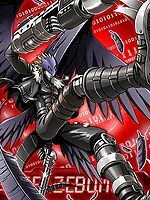 ↑ Digimon Tamers: "Beelzemon's Big Day"
↑ Jūouken is most likely exclusive to the Beelzebumon Blast Mode in Digimon Tamers due to the fact it could only be used because Beelzebumon Blast Mode loaded Leomon's Data. This page was last modified on 11 April 2019, at 22:38.